Some days you just need your supper to wrap you in a warm embrace. And that’s what this recipe is all about. You can find out how to make dumplings all over the place. 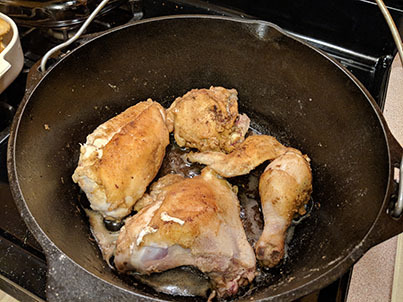 But after frying up a whole chicken in batches and making the roux (because that’s basically what you’re doing, but not intentionally) and letting things simmer, I’m normally a) out of time; or, b) too tired. So, I’ve been cheating lately and using gnocchi as my dumplings. It’s like a wink from that good-looking Italian at the corner store you bump into often. But, you can do traditional dumplings, too. I just prefer gnocchi anymore. If you’re lucky enough to have a market where you can purchase a whole chicken already cut up into fryer pieces, that’s great. That doesn’t exist in my little cottage in the foothills, so I have to cut up a whole chicken on my own. And use a whole chicken: two legs, two wings, two breasts, two thighs, and a back. 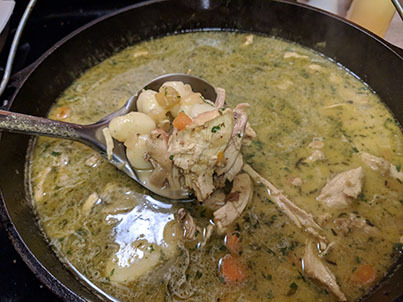 The flavor of your chicken and dumplings will be different if you use just breasts or just thighs. Now if that’s the flavor you like, fine. But the skin and bones is what helps make the broth of this dish not only delicious, but absolutely nutritious, so don’t use skinless/boneless. We want it all in there. This is some of Runa’s liquid gold, or, rather, homemade broth. 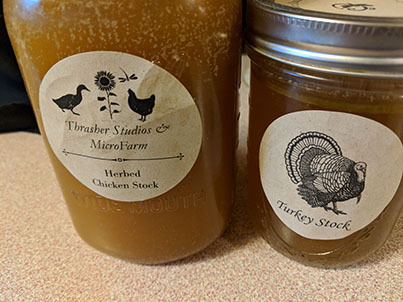 Make your own broth; find a friend who does; but, store-bought is fine as well. I always make my own broth, and I encourage you to do so as well. If you don’t have it, however, store-bought is fine. I didn’t include a dumpling recipe here, but you can find them everywhere. Heck, you can even use a Bisquick mix if you like. Remember above, gnocchi is so good in this. I put that the fresh minced parsley is optional. But I always include it. 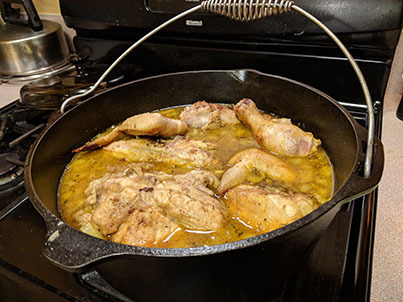 Fry the dredged chicken in batches in your cast-iron cauldron. Infuse this dish with your energy to bring the diner warmth, comfort, and positive change. 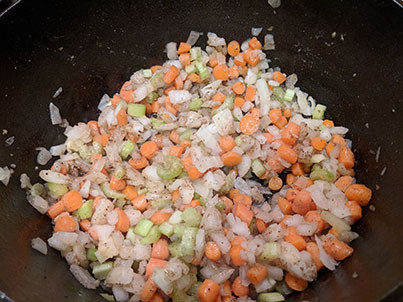 When you add the vegetables (feel free to add a bit more if you like); you’re basically making a roux. This will add to the creamy texture of the broth. Sprinkle chicken pieces with salt and pepper, and then dredge both sides in flour. Melt butter in a pot over medium-high heat. In two batches, brown chicken on both sides and remove to a clean plate. In the same pot, add diced onion, carrots, and celery. Stir and cook for 3 to 4 minutes over medium-low heat. Stir in ground thyme and turmeric. Next pour in chicken broth and apple cider. Stir to combine, then add browned chicken. Cover pot and simmer for 20 to 30 minutes, depending on the size of your chicken pieces. While chicken is simmering, this is when you would make the dough for the dumplings. If you’re using gnocchi, just have it ready to go by the stove. Put your feet up for awhile and savor how good this is making your house smell. Remove chicken from pot and set aside on a plate. Use two forks to remove chicken from the bone — or your hands. Shred, then add chicken to the pot. Pour heavy cream into the pot and stir to combine. Drop the gnocchi into the simmering pot (or make your dumplings here if you like). Add minced parsley. Cover pot halfway and continue to simmer for 20 to 30 minutes. Check seasonings; adjust if necessary. Allow to sit for 5 minutes before serving. Serve with a hearty hunk of bread and your family, diners, whomever you made this for will love it and you for making it!